SRM Stickers & a Giveaway! SRM Stickers have been around a long time. They started out in stationary and then decided to venture into the scrapbooking world in 1997. We decided to give SRM Stickers to 4 of our reporters to see what their views were. Below is an example of a sheet of their stickers. Let's see what our designers did! I liked the variety of these stickers. There were a lot of different sayings and different fonts to choose from. They were very easy to remove and place onto your project. I liked them being on a clear background so placing them where I wanted them was effortless. I used them on a scrapbook page for the background but what I really see these stickers being used mostly for would be card making! 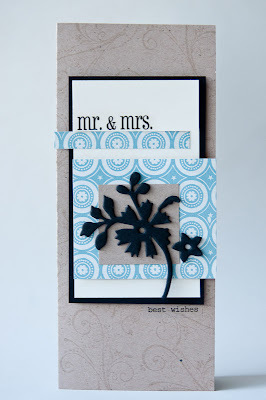 What a quick and easy way to add a sentiment to a card! And some very cute graphics (cupcake) too! SRM Stickers make for easy titles, especially on cards. The fonts and sayings are very usable, however I'm personally not fond of the outer lines that stickers leave (as opposed to using rub-ons or individual letter stickers). I feel that SRM stickers are much more appropriate for cards than Layouts. The one thing I didn't like is that you have to be exact when you place your sticker. There is no picking it back off and placing it where it needs to be. If you do this, you rip the paper up with it. Other than that, they are perfect for the quick sentiment a card needs. What do you think? Are SRM Stickers something you would like to use? Leave a comment by noon EST on Thursday and you will be entered to win a prize pack from SRM Stickers! Fantastic examples from the TSR team! I'm not sure what the actual packages of stickers look like, but your designs are fantastic! They do look really cute on the projects you guys created! Great job! It would be nice to see what a sheet of the stickers looked like. I plan on teaching some craft classes to some youth at our campground. The tweens really like stickers on the items they make. I like all the great ideas the TSR give me. Thanks alot for the informative reports. I haven't used many stickers lately, but these look pretty fun for card making. Wow! Absolutely stunning cards! They look like rub-ons! I'd love to try some of these stickers! Love these. great designs! Would love to get into making cards. These look like they would be great. I'm not a big sticker fan but have been hearing about these everywhere! Sounds like something I might need to try out. I've used SRM stickers before in a school themed album. I wouldn't have bought them on my own, but the LSS owner donated them to me to make a "just add photos" scrapbook for a charity auction. The stickers are great if you stick them down on cardstock and then cut or punch out around them to make custom-coloured embellishments, but really, I much prefer rub-ons for everyday use. Like Noel pointed out, the outline of the edge of the clear sticker is not particularly attractive on a finished page. Woohoo! I would love to win these! I think I have some SRM stickers - and I like this set. I don't use a lot of stickers but I believe in keeping a lot of variety in my stash for versatile cards and layouts! I struggle with sentiments on cards so these are perfect for me! I have played with them and they are fantastic! Great reviews! I appreciate the honesty! 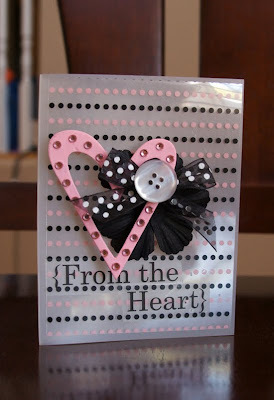 Based on the comments, I think I would enjoy them since I am primarily a card maker! 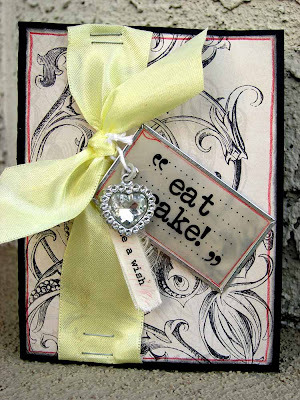 I love to make cards and LOs, and even though these are smaller sentiments, and they would be perfect for cards; I know these would be great for the mini-chipboard-albums that I LOVE to make for my family and friends. I wish I had known about these around the holidays. I was whipping up chipboard albums and love little treats like homemade desk calendars, using rubons, small sticker embellies, and the likes, and these baby stickers would've been a GREAT addition! Thanks gals! Love this option! When I can't make words digitally, I get a bit tired of putting sticker or rub on letters together to create my sayings. I'd love these stickers to "say what I need to say". I'd love these! 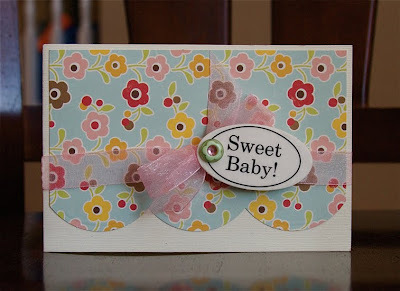 I have been dabbling more into making cards and these look like they'd make it so easy to add sentiment and cuteness! Ooooo, I think I would like these. I used to use stickers when I first started scrapbooking but I might have to start using them again. oooh I love the creations they are GORGEOUS! I am relaly picky when it comes to stickers....but these look fab! Super cute! Thanks for the chance to win. I would use these stickers for cards for sure. I love the sentiments and the fonts they used. 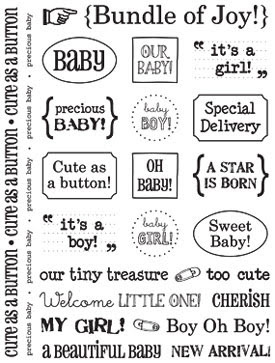 I am usually too lazy to dig through my stamps to create a sentiment and would love the ease of these stickers. Love what you did with the stickers, all the projects are so cute! I on't use stickers often, but the sayings would be great for s/b pages. At the last retreat I went to, they gave us 2 sheets of these stickers. They were fun to use and putting them on colored cardstock changes them altogether. very cute! cant' wait to get my hands on some! Oooh, great cards - and those stickers really added a nice touch to them! I've never used SRM stickers before so it's nice to see those ideas. You gals did a great job with these stickers! I have not thought much about stickers until recently and hear that this company has a great product. I went looking in some 'old stash' of mine and found a few of this brand too! Would love to win some to add more variety! Thanks for the chance! Great cards! 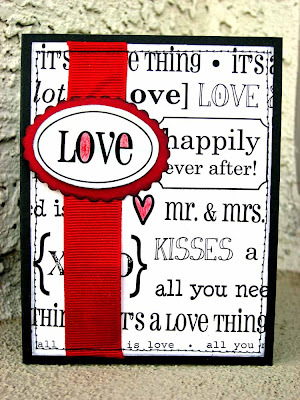 I love sticker sentiments, makes it easy when creating cards. Thanks for the chance to win. I use stickers on my LO all the time. Would love to win these. I find it interesting that something so blah...words in black, can look so fab when used! I have a problem placing stickers as my hand shakes. I found if I hold the sticker wth tweezers it is not a bad. Go figure! These cards are great! I'll have to dig out old some stix and make use of them!! If I really had to pick one favourite thing about SRM stickers it'd be that the hot sayings have been giving me a mojo lift with ideas for card styles and that the sweet fonts makes things feel much more polished. When I started scrapping I used TONS of stickers. Not so much anymore. I do really like clear backed stickers. I think the sentiments would be greatfor when I need to "whip up a card really quick". Thanks for the opportunity to win! It is so cool to find this review site. I love seeing what other people do with papercrafting items. It helps me decide to buy things! These look like they'd be good for lots of projects! I would love to try these clear backed stickers. Thanks for the chance to win. I could find MANY uses for these! I don't have that many stickers, so these would be wonderful! I havent heard of this company but I would be willing to give them a try!! I started following SRM's blog a little while ago when I saw a couple of people I admire designing for them. Seems like good product - lots of designs, and the sentiments are clear, so they can be applied to different backgrounds and the pattern still be seen. Never seen the stickers in real life though, so thanks for the chance to win a pack! Thank you for the review, TSR Team! We love your site. Oh, I would definitely like to try them. I'm always looking for great sentiments and how easy would a sticker be!!! Very cool. I would definitely use these for card making. Thanks for a great giveaway. Cute stickers! Would love to use them for cards. Thanks for the chance to win!! They look fun to me! I wish they came in white or chocolate too though. Especially the baby ones. I'm nit a huge fan of black! I probably wouldn't use these on a scrapbook layout, but I always love finding quick/easy ways to add sentiments to handmade cards. I would definitely use them for that! Thanks for adding in the photo of the sticket sheet - that helps me visualize what I might be purchasing. I haven't been much of a sticker person the last couple of years, but I love the way these look in the examples from your design team! I love the fonts and the sentiments. I have to admit that I've never heard of them before...but would love to give them a try for cards! i could see where these stickers would be fun to use! I would love to try them! I can most deffinatly see where one would automatically see these for cards-and as a card marker these could most deff-make life a little easier! But I like what you guys did with the layouts too! I'll have to look for these Thanks for showing them to us! These stickers look nice. Your reviews are great & I like that you gals never pull any punches (pun unintended). I'm not sure how I'd use them, since I only rarely do cards and I'm not sure they'd work well on layouts, but I'm always up for a challenge. (and when I do make the occasional card, I do struggle for a quick sentiment) -- ok, guess I really would like to try these!! lol.. The look like a nice variety of stickers. I would use them. they look so cute! love the designs of today! Thank you to The Scrap Review for featuring SRM Stickers. We appreciate it. And thanks to all the people who left a comment. Hope you win! I love supplies for easy card making! love these Stickers and the projects are amazing! !